Everyone knows that if you’re looking for endless options of the best cuisine, that the International Drive Resort Area is a great place to be. But, many don’t think about the variety of forward thinking fare that you can find on I-Drive. 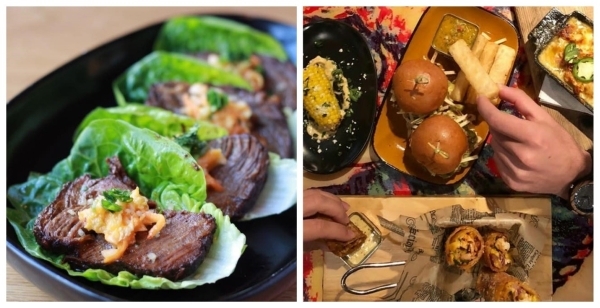 Next time you’re looking for a bite to eat and want to indulge in something a little different, be sure to check out one of these 5 forward thinking dining options! If you’re look for fun forward-thinking food that is inspired by farm fresh agriculture and old recipes with a twist, look no further. Hash House A Go-Go offers a dining experience that is exciting, entertaining, and will have you craving twisted farm food that you just can’t find anywhere else. With a menu full of things like sage fried chicken with bacon waffles, crispy hand hammered pork tenderloin that doubles as breakfast or dinner, a variety of stuffed griddle burgers, and trailer wheel sized pancakes made with Snickers, red velvet, butterscotch almond, banana brown sugar and more, you’re sure to find a new favorite! With over 10 years of experience, each entrée on the Hash House A Go-Go menu is famously delicious and has been uniquely perfected to ‘wow’ you each time you dine here! If you couldn’t tell from the name, this location offers a uniquely delicious mix between two of the most beloved entrees: Sushi and Burgers. The first ever Sushi Burger Bar, the Cowfish Sushi Burger Bar is dedicated to serving up creative, hearty meals that pack a punch of flavor, while using fresh, never frozen ingredients. With a little bit of everything on their menu, everyone in your group will find something to enjoy; from meals made for sharing and entree-sized salads to homemade desserts and a fun kid’s menu. If you’re feeling thirsty, they’ve got exactly what you need to quench that thirst, including spiked hand-spun milkshakes, premium sakes, craft beer, wine, and 10 oz exotic martinis. While you are here, be sure to try one of their special signature creations, referred to as “Burgushi.” Indulge in this cutting-edge fusion of burgers and sushi rolls, featuring a sushi roll created using burger components, and pick-up style sandwiches created using sushi ingredients! 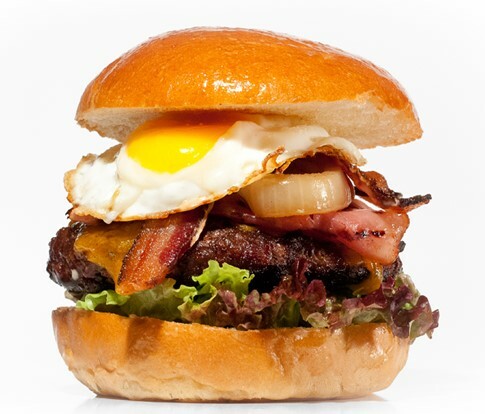 Don’t let the name fool you, the menu at Sugar Factory contains savory, sweet, and everything in between! If you’re looking for foods and drinks that are one of a kind, that will truly shock you every time, the Sugar Factory is the perfect forward thinking fare for you. From a variety of Sugar Factory signature drinks called, “Goblets”, and a mix of martinis and cocktails that you’ve never seen done before, to out of this world burgers, drool worthy appetizers, and a list of entrees that everyone can appreciate, there is a lot more to the “sugar factory” than meets the eye. But the forward-thinking fare doesn’t stop there, be sure to leave room for one of their exclusive desserts, including cakes, gourmet ice cream sandwiches, premium chocolate fondues and insane milkshakes! Next time you stop in and you can’t decide between savory and sweet, we recommend one of their signature insane milk shakes, the Bacon Cheeseburger Milkshake, featuring strawberry ice cream drizzled with strawberry sauce and topped with whipped cream, a mini cheeseburger, candy bacon, pretzels and M&Ms® in a chocolate covered mug with pretzel pieces and M&Ms® candy. Be prepared to try something deliciously different. 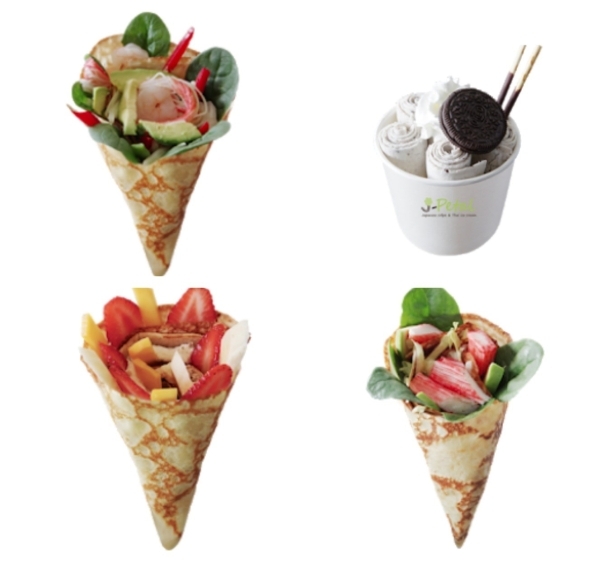 J-Petal serves up Japanese Crepes & Thai Ice Cream. Here you’ll find crepes made with 100% rice flour that have been carefully crafted using fresh vegetables, fruits and meats. Each recipe’s ingredient combination was tested thousands of times before making its way onto their menu, so there is no doubt that each recipe offers a unique taste that will leave you wanting more. Just some of the menu options you’ll find at J-Petal include beef, chicken, crab stick, shrimp, lettuce, carrot, red pepper, red onion, baby spinach, sesame and Japanese mayonnaise, coming together to create the “J-Petal special” and crab stick, baby spinach, corn, sesame with Japanese mayonnaise to create the “Crab Crepe.” But of course, we can’t forget dessert. Indulge in delicious dessert style crepes that will take you to another world of delight, like the Hawaii Sunset made with strawberry, banana, mango, whipped yogurt, custard cream, pistachio, and Nutella. Or, if you want something to cool off, try one of their various Thai Ice Cream favors, each freshly handmade per order! This multi-cultural eatery resembles a wild artist’s loft in Barcelona Spain and provides unpredictable entertainment for dining guests as various artists come to create their art at art stations throughout the restaurant; so, of course it’s no surprise that when looking for forward thinking fare on I-Drive, Café Tu Tu Tango’s is a must visit! The all-appetizer menu at Café Tu Tu Tango was designed to be particularly intriguing and fun when ordered in multiples and shared with friends! From appetizers like Moroccan cauliflower and jalapeno mac and cheese, to pizzas and gourmet flat breads, and a variety of incredibly well put together tacos, sliders, and rolls, everything on their small-plate menu is extensive, eclectic and diverse. Each item on the menu has been specially prepared from scratch by a team of exceptional chefs, led by Executive Chef José Camey! Sip on some popular red and white sangrias as you stroll the streets of Barcelona Spain, take in the beautiful art, and ‘¡Salud!’ over a delicious shareable entrée. When you’re looking to switch things up and try something new, don’t forget to check out one of these International Drive dining destinations that feature forward-thinking fare! We’re sure it will be an experience to remember. Enjoy!